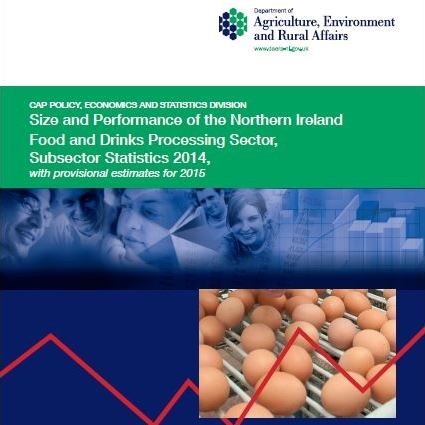 The Department of Agriculture, Environment and Rural Affairs has published its annual report, ‘Size and Performance of the Northern Ireland Food and Drinks Processing Sector, Subsector Statistics’. The report contains comprehensive data on the values of sales, exports, value added and number of employees for each of the ten constituent subsectors of the food and drinks processing sector in 2013 and 2014. These key statistics are supplemented with fifteen performance indicators for each subsector. Provisional estimates of sales and employment are also provided for 2015. In addition, a time-series of data covering the period 1989 – 2014 (and 2015 where available) has been published on the DAERA website for each of the main variables. These will enable users to identify trends over time in variables of interest to them. The value of sales for the Northern Ireland food and drinks processing sector increased by 1.5% from £4,477 million in 2013 to £4,544 million in 2014. Provisional estimates indicate sales have increased to £4,596 million in 2015 (1.1%). The rate of growth is lower than in many previous years. In 2014, the food and drinks processing sector is estimated to have contributed 3.7% of Northern Ireland’s total gross value added. The food and drinks processing sector, as defined in this publication, contributed 23% of external sales, 21% of export sales and 28% of total employment in the Northern Ireland manufacturing industry in 2014. The sector’s proportion of total manufacturing sales remained unchanged at 25%, while the share contributed to the value added of the manufacturing industry was 15%. Within the sector, the beef and sheepmeat and milk and milk products subsectors continue to be the largest subsectors in terms of gross turnover for both 2014 and 2015. Together, they account for 49% of the sector’s total gross turnover in these years. The Great Britain market continues to be the largest outlet, with sales increasing to £2,010 million in 2014 (representing 44% of total sales). The Republic of Ireland was the most important destination for export sales, accounting for £708 million in 2014; 16% of total sales. In both 2013 and 2014, the value of exports to markets outside of the UK exceeded those to the Northern Ireland domestic market. In both 2013 and 2014 all ten subsectors traded profitably. The total number of direct employees in the sector decreased by 0.4% from 20,843 full-time employee equivalents in 2013 to 20,758 full-time employee equivalents in 2014. Direct employment in 2015 increased by 1.4% to 21,048 full-time employee equivalents.